I haven't gone through in detail for all the Starfleet vessels I know of, but it seems that all Enterprises seen in the TV show and movies have bridges positioned right in the top middle of the saucer section. I am wondering why this is. This seems to be a very vulnerable location, and in at least one instance (ENT episode "Twilight") the bridge's vulnerable location leads to its destruction. It seems like a bad idea to have the bridge positioned there. I seem to recall Gene Roddenberry had specified this should always be the location of the bridge for Starfleet ships. Whether or not this is the case, I still must ask, "Why?" In the Star Trek: Next Generation Technical Manual, it is mentioned that the Bridge module is replaceable. This makes a case for why the bridge should be where it is. The concept of the replaceable bridge module originated during Star Trek V, when we were working with Herman Zimmerman on a new Enterprise bridge that was quite a bit different from the one seen in Star Trek IV. We rationalized that this was because the bridge, located at the top of the saucer, was a plug-in module designed for easy replacement. This would permit the ship's control systems to be upgraded, thereby extending the useful lifetime of a starship, and would make it easier to customize a particular ship for a specific type of mission. This concept also fits the fact that we've seen the main bridges of at least four different Miranda class starships, the Reliant (Star Trek II), the Saratoga (Star Trek IV), the Lantree (Unnatural Selection) and the Brattain (Night Terrors), each of which had a different bridge module. The problems with this placement are clear, but we also see that unshielded starships are extremely vulnerable. If an enemy wanted to destroy your ship, they would be better served by targeting the reactor. If they wanted to kill the bridge crew specifically, they could always beam them out into space, no matter where the bridge was located. Officially, because Gene Roddenberry said so. Part of the ship design parameters places the bridge on the top of the ship as per his specifications. He had strict design parameters set for all the ships of the series. Roddenberry's Design Rules: The following are Gene Roddenberry's official design rules. I found them at Jim Stevenson's Starship Schematic Database. Rule #1 Warp nacelles must be in pairs. Rule #3 Both warp nacelles must be fully visible from the front. 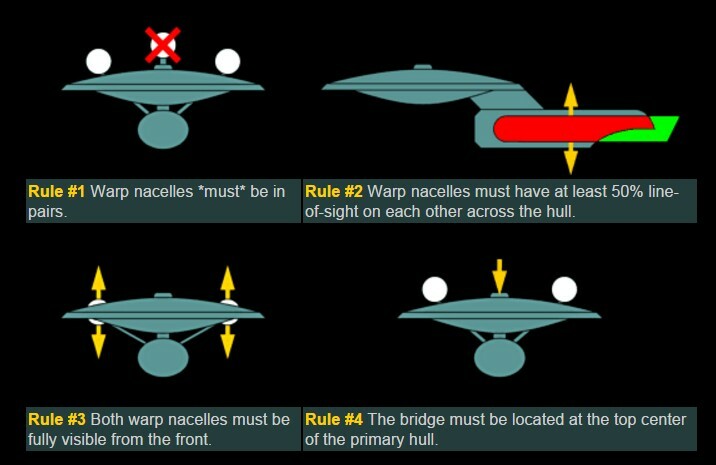 Rule #4 The bridge must be located at the top center of the primary hull. Recently Andrew Probert confirmed at Trekplace that these are really the design rules that Roddenberry and he himself nailed down for TNG. Given the metaphor of starships as battleships, and Roddenberry's military experience, he is placing the bridge of the ship in the same place it would be on most military naval vessels of his time. Note the windows in the front of the bridge area. Substitute bridge monitor on board a starship for the viewports. However, in the real military, the bridge is capable of viewing the external world because captains and their command crew might want to be able to SEE their enemy with binoculars or other optical equipment. In space, this makes no sense, since the enemy is far beyond the range of normal vision. Scientifically speaking, given that it's a starship and uses external sensors, it doesn't necessarily make sense for the command region to be physically at the top of the ship. In fact, the actual bridge should be deep within the ship like the auxiliary bridge control area is on combat Federation vessels. Since Federation starships are equipped with shields and the forward shields are the strongest shields on the ship, perhaps it is no more vulnerable than any place else on a starship, since without the shields, most ships don't appear to be able to withstand a concentrated barrage of fire from enemy vessels anyway. There's a multi-part answer to this. This is not an actual spaceship. It's an elaborate fantasy backdrop upon which the actors play out mostly ancient and classic story types. The bridge of the starship is the "executive suite," where the leaders lead from. You don't see the President of the USA or the CEO of Apple setting up their offices in the bowels of the cellar. The bridge is where the Executive-class folks hang out. They're the bigwigs. The bridge needs to have an executive flair to it, and being up in the apex of the ship helps us earth-bound folk understand that it does. Finally: the layout of the bridge and the notion of its importance and placement really has to make sense to us, the viewers, not to be actually an appropriate layout for running a real ship. Also, it has to be pretty handy to the camera people getting the shots. One of the reasons that the layout is circular...no matter what angle you take your focus on the captain, there's a flash of equipment/tech station behind him. The layout of the ship also has to be flawed in order to allow for plot twists and conundrums. The bridge is actually not a valuable target on a fighting ship. Killing the captain and some of the command staff will not render the ship inoperable. It is more valuable to target ammunition storage, engines or power systems in an attempt to sink (in this case depressurize), disable or destroy the target. In the case of space travel, I believe that a fighting spacecraft would have a similar design to that of a submarine. So to answer the question, at least as it relates to ST: TNG - they were able to position the bridge so vulnerably (or to look at it another way, so prominently) because it could afford to be vulnerable: they have a dedicated secondary bridge for battle situations. One important thing to remember in the specific case of the Enterprises - they aren't military vessels; they're roving science stations. So, the logic behind their creation wouldn't inherently be that of a military tactician. Really, a starship bridge would be more inside the vessel, but for aesthetics relating to sailing ships, having a bridge that can be prominent and easily located is natural. Let's face the fact that even though the Enterprise isn't designed to enter the atmosphere of a planet, it still is shown as being upright even relation to other spaceships even though there is no up or down in space.Now some ships like the defiant class have enclosed bridges, and less prominant profiles. And in later Star Trek shows, you see the full use of XYZ axis manuevering, as well in the J.J. Abrams movies. In real life, the beautiful shapes of the Trek starships we all love wouldn't be practical designs. Because once the shields are down, it doesn't really matter where the bridge is located. If your aggressor still has shields, whether you're buried deep in the ship or not - you're still dead as you have no ability to repel the enormous amounts of damage that enemy weapons deliver. In addition, in a combat scenario where all sorts of jamming and electronic failure are possible, you don't necessarily want to rely on those systems to be able to navigate through the confrontation. In many of the fleet engagements we see in Star Trek, within a relatively short amount of time, the encounter takes place within visual range. Much like when piloting an aircraft or driving a car - you want to be able to see where you're going as opposed to looking down at a display (which may be destroyed in combat as well). Psychologically, it establishes the bridge crew as the most prestigous officers on the ship. Whereas we never see the poor schlubs assigned to the "bottom". If you look at the two pilots of TOS, the opening "curtain" is the viewpoint swooping up the the top center of the saucer and then the cast is revealed through the figuratively invisible ceiling at the top of the dome. This may have been the intended way to open up Star Trek episodes which would have necessitated the bridge being on top. The location of the bridge as well as of the battle bridge is also an interesting metaphor for Starfleet as a whole: the main bridge is out in the open, which is good for negotiations (it can show that you have nothing to hide, which could help make others more amicable), but the battle bridge is buried deep inside the ship, where it's less vulnerable to weapon fire. This is a reflection of Starfleet's stance on combat: while peaceful exploration is their main goal, they're ready for a fight if push comes to shove. As mentioned in Enterprise S04E06 The Augments, the bridge of the Klingon ship has very strong bridge armor that deflects almost any weapon fire. Based on that I think that most post-Enterprise bridges implement a similar technology. Therefore the bridge is generally safe from most types of weaponry. Also some ships such as the 1701-D had a battle bridge. In TOS, they often zoom in on the captain sitting in his chair on the bridge from a viewport. This indicates that the viewport is actually a window that you can physically see out of... potentially the bridge might actually be able to "rotate" which would give you 360 degree view of the space around you. Although they do have "magnification" enhancements, so its possibly some sort of Window+Screen hybrid... where the window is made of some extremely strong material, as invented in Star Trek IV by Scotty. 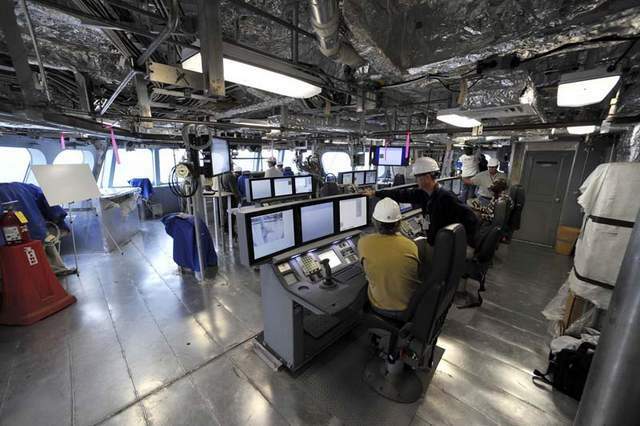 All of this makes sense, as if you were to embed the bridge within the ship, you would have to rely solely on a computer screen, which relies on: a) sensors, and b) cameras - which can be disrupted by technology. Something not proposed in Star Trek, but would make a lot of sense, is to make the bridge a "mobile" module, that moves up and down through the interior of the saucer section... kind of like a periscope. So that if the sensors or cameras are in question, you could move the bridge module up to take a look around. Also... I believe the whole star ship is designed to be modularized, as you have seen that, they are able to jettison entire modules. So each module might even have its own force field, (i.e. sub-shield generator) that way... in the event that the exterior shield ever went down, if you hit a single module, it would help to mitigate the damage of each individual module. This could explain why, when a room is damaged in a ship, you will always see a force-field covering the exposed area. You can see that they can create force fields in sections, all around the ship... it makes sense then, that every deck/section has its own sub-shield generator, which ultimately helps protect the structural integrity of the ship. Layout of materials (i.e. bulkheads). Then its clear that it is not as vulnerable. Also considering, there is auxiliary control, which would be used as a secondary bridge, and is in a more safer remote location. Then consider, if the saucer section were to detach, and to make a crash landing... (which Kirk has done at least twice). Would you rather be in the crow's nest, or would you rather be in the heart of the ship, that will take the brunt of the structural stress? I'd like to think that the bridge is capable of moving up and down levels, like a turbolift, like a periscope. That would be best. Are Star Trek ships' bridges protected against beaming torpedos into them? Why not seek shelter in the inner compartments of the Enterprise? Why are the bridges of Klingon ships so steamy? Are battle bridges on any other ship besides the Enterprise?